Is it possible to design your wedding dress on your own? You have an idea in your mind's eye of the wedding dress you want. You've described it for your friends, and you've even sketched it out roughly. But you've visited dozens of bridal shops in your city. You've thumbed through every bridal magazine you could find. And you've surfed in and out of dozens of internet boutiques. Some of them have the right bodice but the wrong sleeves. Others have great sleeves but the skirt's all wrong. Maybe you've seen a dress you love, but you hate the fabric. Nothing you've seen is exactly what you envision for your wedding day! So you're starting to wonder-why not design it yourself? There are two ways to go about this, but before you read on there is one caveat you must consider: You cannot possibly go about designing your own wedding dress if you don't have enough time before the wedding. You will need the time to come up with a pattern with modifications that work and find someone who can bring it to life for you well in advance of the wedding. If you doubt this advice, then think about the shows you've seen on a popular television network for all things bridal where the bride has been screaming at her seamstress just days before the wedding. Or consider the brides that end up in front of popular television judges just weeks after the wedding. 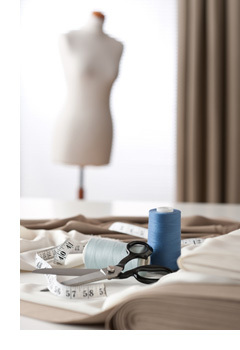 Show your ideas to a designer or seamstress. 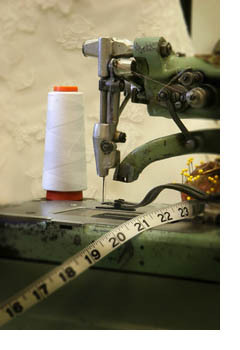 To locate a seamstress, visit your local tailor-or get a recommendation from your local dry cleaning establishment. Check with the area art institute for a seamstress who is graduated. You might be able to save money if you find a gifted student. Or ask at the nearby dance academy whether there is a local costume designer. Do it yourself. You have to be totally confident in your abilities before you undertake such a task. And even if you plan on doing most of the work yourself, you would be wise, nevertheless, to find someone who can do you fitting for you, there is no way you can do your fitting yourself. Some seamstress/designers can offer you a pattern making service, all you need to supply is the sketch of your ideas and don’t forget the design for back of your dress. If you're hiring someone to sew part or all of your dress, negotiate a written contract. Agree on the length of time the professional has to perform his or her job. How many fittings are free? Please also understand that some of the wedding fabric can not be altered as the stitching leaves permanent mark on the fabric. Any good seamstress will do your preliminary fitting in calico, so when your wedding fabric is cut and sewn it should fit perfectly. Any adjustments during the course of the project should be made on the calico block, negotiate how many times you can request adjustments without incurring additional fees. Try to make all you design details adjustments before cutting as a small change of as little as 3cm on a v neck can cause a gap in the neckline, if it has not been adjusted for during the pattern making. Keep adjustment to a minimum once cutting has commenced, but do negotiate how many times you can request adjustments without incurring additional fees. Once the seamstress begins charging you for alterations, how much will each one cost? How many days before the wedding do you want the finished product? No matter which method you choose, if you design your wedding dress, you've got to start with a pattern. Go through the pattern books at your local fabric store and choose a pattern that's close to the design you want. If you admire the sleeves on one dress and the bodice on another, buy both patterns. Whether you're working with two patterns or adding adjustments of your own, find a work table large enough to lay all pieces of the pattern before you ever cut into fabric. It's important to know if the sleeves of one pattern must be cut larger or smaller to fit the armholes of the other pattern, for example. Or if you plan on cutting the skirt wider, you need enough room on your table to mark the panels larger. Most patterns carry size charts on the package back and a lot of patterns will be marked in 3 or 5 sizes, that makes it a little easier for you to cut a pattern that is perfect for you. Please have yourself measured by an expert, either by your seamstress or by a sales lady at the local undergarments store. Even if you don't like the numbers on the tape measure, don't fool yourself when you design your wedding dress and choose the pattern size. Patterns are manufactured to be pretty accurate! 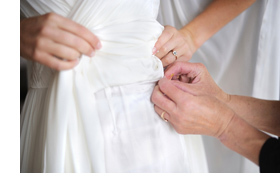 Talk with your seamstress about how to design a wedding dress and the type of wedding you are having. If the setting is formal, within a church, find out if the church has a requirement for neckline depth. And pay attention to the back detail: No matter what location you choose, your back will be to your guests during the ceremony. If you design your wedding dress from the front perspective, remember to put some oomph into the back view! Besides worrying about neckline modesty requirements of the church, you and your seamstress should be on the same page about your neckline, your sleeves, and train, and even the snugness of fit. Is your seamstress providing the veil? Do you need a jacket or shawl? All of these items need to be considered when you design your wedding dress. If you go about it carefully, the result will be worth it. You will have a unique wedding gown that stuns your groom and your guests on the day when you walk down the aisle and live out your childhood dreams...to make your wedding day your own.